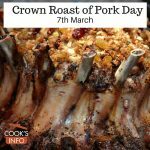 Today is reputedly the day on which to enjoy a Crown Roast of Pork. 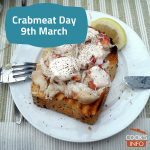 Crabmeat Day is such a delicious day; only a crab would want to miss it! 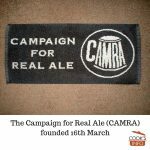 The 16th of March is the birthday of CAMRA, the Campaign for Real Ale. It was founded on this day in 1971 by young journalists from the Manchester and Liverpool areas. 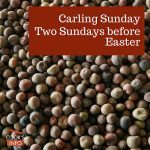 Carling Sunday, otherwise known as Passion Sunday, is celebrated in Scotland and in northern England on the fifth Sunday in Lent, two Sundays from Easter. Boiled, fried dried peas known as "carlings" are served. 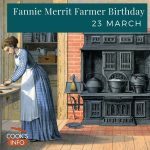 Fannie Merritt Farmer was born on this day, 23 March, in 1857 in Boston. She revolutionized the way Americans cook. 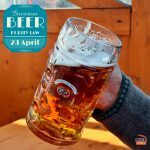 March 23rd is “Toast Day”, (believe it or not.) 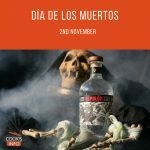 Reputedly, it was chosen because it was the day that Nellie Melba revealed her Melba Toast recipe in 1901. Though this has myth all over it — for starters, it wasn’t her recipe — any day’s a good day for toast. 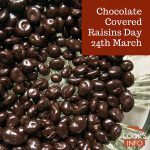 Chocolate covered raisins can be very hard to stop eating, as they are so morish! 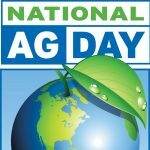 Well, here's a day where you don't have to stop yourself!